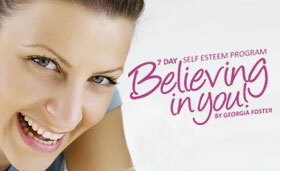 7 days to The Confident Intuitive You – Build your self-esteem and self confidence with this amazing program! Remember, the first day is free. Try before you buy. ‘My Believing in You’ Program is a powerful, inner journey that will train your brain to feel better, inside and out. To my knowledge, this is the first online, fully downloadable, tried and tested self-esteem program, which integrates powerful self hypnosis techniques and an incredible life changing psychology theory. Do you feel less worthy than other people? Do you worry that you don’t cope as well as others? Do you criticise yourself a lot? Do you feel socially anxious? Do you feel professionally anxious? Do you take things too seriously or personally? Do you have a strong fear about the future? Do you attract bullying friendships or relationships? Do you have the inability to say the word no? Do you feel everybody else is more clever or better looking than you? If you answered yes to any of these questions then your self-esteem needs to be developed. It is a fact of life that some moments can be challenging as we often perceive our lives though eyes of negativity and self-doubt. When this occurs our coping strategies become foggy and full of fear. I believe this is a learnt behaviour that you can unlearn. Everybody, including you, deserves to enjoy living their life with more confidence and self worth. It doesn’t mean your life will be perfect, but rather an evolving journey of self discovery that is fun and enlightening. Improving self-esteem is like learning an emotional language. You need to hear and feel good things about yourself regularly, from within. It is important to know that you can experience being an optimistic, charismatic, communicative person with yourself and others. It just needs a little practice with the right tools.